Summary: Jane Seymour is the daughter of knight. With aspirations of becoming a nun, she did not consider that life at court was in her future. However, when her plans to join a nunnery change she joins the household of Queen Katherine, the wife of Henry VIII. 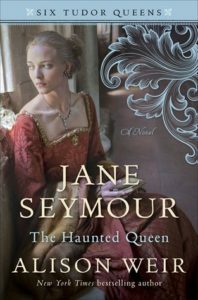 Jane is devoted to the queen so when a maid of honor, Anne Boleyn, starts to attract the king, Jane must decide where her loyalties lie. When Anne becomes queen, Jane is forced to serve her. As Anne’s power wanes the king’s eye begins to stray. Jane becomes the focus of his attention and his future queen. Highlights: Weir’s portrayal of Jane Seymour is the best one I have read. Jane is a very boring queen. She has very little time to establish herself in history but what we know of her is that she was meek and obedient. At least this is what we assume but in The Haunted Queen we get a little bit of fire injected in to her character. She has opinions, thoughts and questions. Even though she is afraid to voice them, we as the reader get a look into her mind and see more than the quiet mouse she is remembered as. Lowlights: I felt that more of the book was centered around Anne Boleyn (who is my favorite of Henry’s wives). We see the events unfold through Jane’s eyes but not much about Jane herself. Which leaves a small portion at the end of story to center around her time as queen. FYI: Weir does a great job so far on each of the queens. Check out Katherine of Aragon: The True Queen and Anne Boleyn: A King’s Obsession to read the first two books in the series. Previous Previous post: Book dilemma: purchase or borrow?